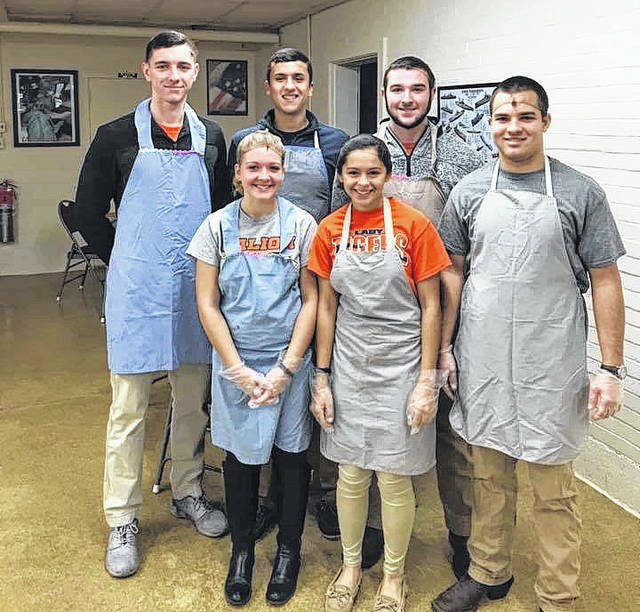 GALION — Six Galion High School students spent time Nov. 15 giving back to the community. They assisted with the annual Thanksgiving meal at the Galion Golden Age Center. Aaron Barnhart, Brady Bonham, Clay Karnes, Colten Skaggs, Ashley Sallee and Teresa House donned aprons, hair nets and plastic gloves to provide extra assistance in the center’s kitchen and dining area. The students helped set the tables, assisted in the kitchen washing and drying dishes and served dinner to the senior citizens during the event. Galion Golden Age Center is a member-driven organization, and provides programming for adults in Galion 50 and older. The Galion Golden Age Center, 301 S. Market St. is looking for members and volunteers. Call 419-468-5152 for information.